Please meet Helen Kirlew -Smith. 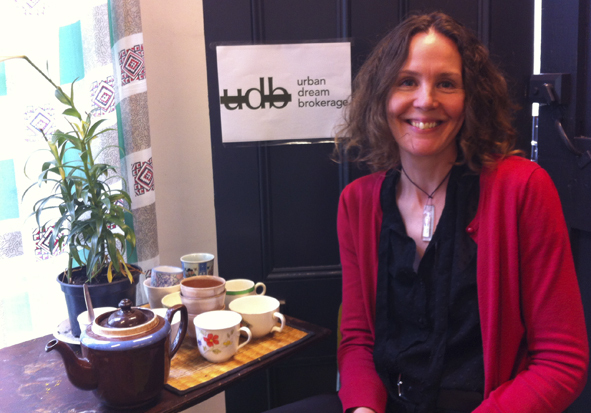 She is your local urban dream broker from the Urban Dream Brokerage. What is an urban dream broker I hear you muttering? Well if you are anyone with ideas – artists, designers, community groups, social entrepreneurs or fledgling businesses – Helen will explain all and how she can help YOU, to interact with the city in exciting new ways. Helen will also be telling us why she loves her crazy job and how she has seen first hand the positive changes this concept is having and can have on our city. Don’t be shy now, propose away. She really wants to hear from you. This entry was posted in Arts & Culture, Enterprise by lauriestarfish. Bookmark the permalink.